GREENPOINT — Adults and kids alike can soon simulate "walking across water" in McCarren Park — and they can learn science at the same time. 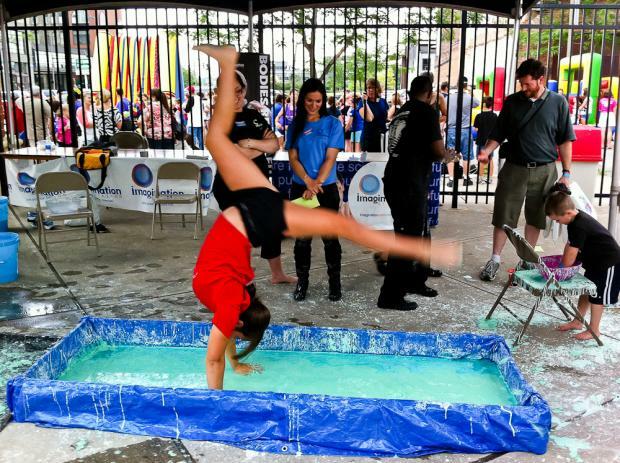 A pool of oobleck — which has properties that allow people to step across its surface or to slowly sink into the fluid — will grace McCarren Park's playground, as part of the future Brooklyn Science and Art Museum's first pop-up exhibit next month. The pop-up — a taste of the ambitious interdisciplinary 100,000-square-foot center slated to open in 2019 — will be a free hands-on educational show timed with McCarren's annual environmental festival Go Green Greenpoint, organizers said. "We thought it would be a really engaging exhibit to show off at Go Green," said Susan Anderson, who runs Town Square Inc., the nonprofit hosting Go Green, and is planning the new museum. "The oobleck will be big enough so that adults and kids can run across it...You'll just go boing! It'll be like walking on water." The oobleck — used in the Dr. Seuss book "Bartholomew and the Oobleck" and designed to "show what physics and chemistry can create," Anderson said — will also serve the art portion of the museum's exhibit, local artist Valeen Bhat said, noting that the fluid would be used to create a papier-mâché globe out of newspapers. "We're making a giant orb with papier-mâché and encouraging people to join in making it," said Bhat, who runs the traveling art studio Private Picasso. "It will be a traditional papier-mâché project but with recycled materials...Even the concept of papier-mâché in general, turning something from fluids into hard shapes, has science elements." Go Green will also include a tree giveaway, a cleanup-sweep of McCarren Park, and other eco-friendly activities, Anderson noted. Anderson and other organizers declined to share all the details of their oobleck activities since they wanted to maintain a "surprise element" in the seemingly magical exhibit. But organizer Darrick Borowski promised the activities would be "hands on and feet on" and "logic defying." "It'll be a day of play for all ages," he said. And Bhat said the McCarren show would set a precedent for future pop-ups and for the museum itself. "People can think of a museum as a snooty, academic, unapproachable place," Bhat said. "These pop-ups bring a museum to a nontraditional setting, to expose it to people who haven't experienced it before." The Brooklyn Science and Art Museum's first pop-up will be at McCarren Park's playground May 11, 11 a.m. — 6 p.m. Future dates and locations for pop-ups have yet to be determined.